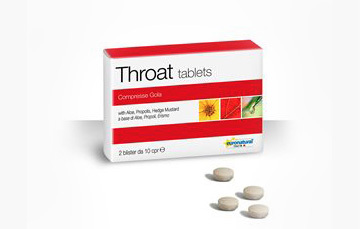 Tablets for the treatment of throat irritations. They contain Propolis, with an high content of galangin, one of the Nature’s most effective antibacterial agents, whose activity is both bacteriostatic and bacteriocidal, Aloe Vera gel, which is rich in hydrophilic colloids of a polysaccharide nature ( mucilage ) with mucoadhesive characteristics, Hedge mustard, the “singer’s plant”, which prevents hoarseness and loss of voice and Curry plant, an anti-inflammatory ingredient useful for soothing and reducing redness, burning and irritation. The intense, balsamic and refreshing aroma provides an immediate cooling effect to an irritated throat, and reduces redness and burning. Let 1 tablet dissolve slowly in the mouth, up to four times a day.